My name is Mary, and I am a friend of Harley’s mom and dad. They have asked me to let you know that their beloved Harley took his last breath today (3/20/16). He went on his own terms … he chose his moment, he did not suffer, and he was not in pain. He passed peacefully surrounded by the love of his mom and dad. Harley’s parents, Rudi and Dan, want you to know how very much your love, prayers and support have meant to them today and throughout Harley’s journey. They will have much more to say in the coming days when they are ready. For the moment, they ask for your understanding as they walk through this incredibly difficult time. We all feel as though Harley belonged to each of us in some way. Now, we all share a common grief that we must each somehow come to terms with. Just know that Harley’s mission will continue, his voice will still be heard, and his light will shine brighter than ever. This is not the end. 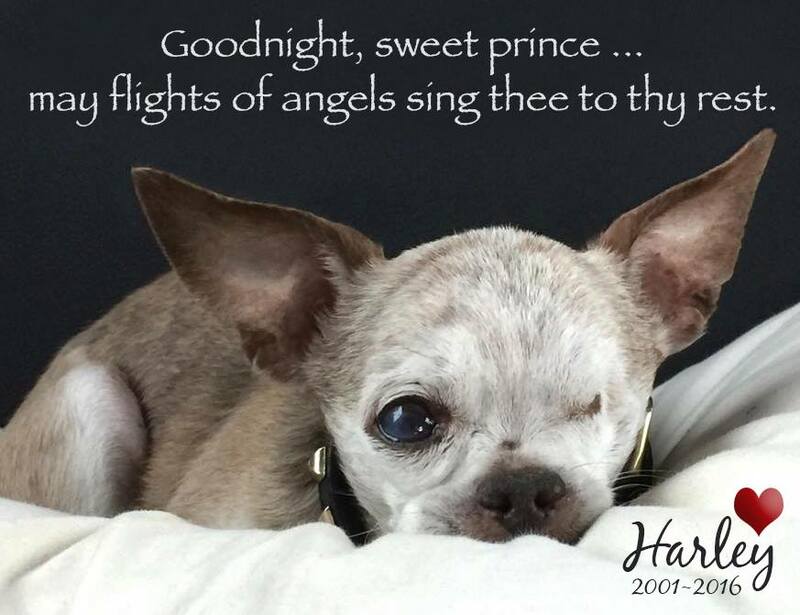 As today is the first day of spring – a day of new beginnings – let this be a new beginning in the fight against puppy mills, and let Harley’s voice be heard through each and every one of us. Harley, run free. You were loved immeasurably, and our lives and the lives of so many puppy mill dogs are better because you were a part of us. You will be missed more than you’ll ever know. We’ll miss you so much, Harley, but we’ll work even harder to get rid of those awful puppy mills! My God watch over your family and bring them peace. I am heartbroken. Have not stopped crying. Bless you Rudi and Dan. …you left such a large important meaningful paw print on this world, you brave angel dog..
Harley you are going to be in all of our hearts forever.We all thought of you as our hero.God Bless mommy & daddy.Rest in Gods loving arms.Until we all get to meet you again.love you so much. I read this on his Facebook page, too, and I am still in denial that Harley has left us. He was such a proud and effective warrior for the fight against Puppy Mills. I know his spirit will still be with each rescue mission.. So heartbroken. 😥 My love to you all. Goodbye, darling Magic Man. So very sad to hear Harley has left us. Thanking you for communicating this way since I am off FaceBook for Lent. Grateful for the Taylors and Harley letting all of us into his life, and for the valuable work he accomplished. Rest sweet boy. You will continue doing great things even though you are no longer with us. Hugs and love to Mom & Dad. God Bless you dear, sweet Harley. You had 5 wonderful years of knowing what it was like to be a family pet who was dearly loved. I loved what this person said, so I’m going to repeat it: …”your wings were ready, but my heart was not.” ♥♥. You will be missed by so many who have grown to love you, that includes me. Your mommy & daddy have my sincere sympathy on your passing. Gone but NEVER forgotten!!! I keep checking Facebook thinking that I’ll find it isn’t true. Truly saddened by Harley’s passing.